Will Zach LaVine participate in another Slam Dunk contest? Zach LaVine —and fill in all the rest of the names— is no Michael Jordan. No, Zach LaVine is better than Michael Jordan. And probably Vince Carter and Dominique Wilkins, also. It’s almost heresy, of course, to suggest such basketball blasphemy. And we sort of take Zach for granted here as he completes his recovery from an anterior cruciate ligament tear. So it’s often all about his shot selection and his contract and his defense, all analyzed with granular inefficiency. To paraphrase Richard Nixon, which doesn’t make me proud, you don’t mind the examination with a microscope. But not so much with a proctoscope. Zach LaVine will not be in Saturday’s annual NBA slam dunk contest that in some respects is the highlight of the All-Star weekend festival, this year in Charlotte. The three-point and dunk contests are the highlights for Saturday before the Sunday evening game. "I’m disappointed I’m not in Charlotte," LaVine was saying late Wednesday night before the Bulls scattered for the weeklong All-Star recess. "But I’m happy the break is coming. I’ll take it as a rest." Next year the All-Star game is in Chicago. So perhaps the man who can lay claim to the title, at least in All-Star contest history, of the most creative and foremost dunker ever will return to attempt a triple. "I’ll see how I’m feeling next year or the year after that," said LaVine. "I’ve still got some tricks in my bag, so I might just do it." Good for us if it occurs. 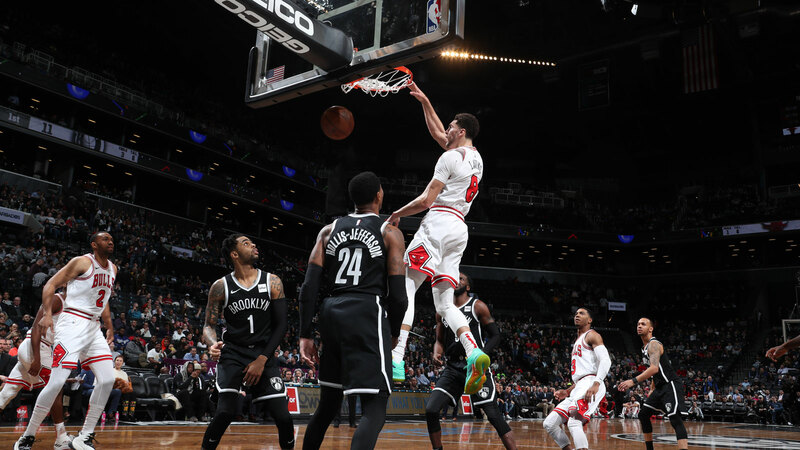 Because LaVine in the slam dunk contests in his 2015 and 2016 victories produced arguably some of the most aesthetic and athletic performances in the history of the contest that in the NBA dates back to 1984. The ABA basically invented the contest at halftime of its 1976 All-Star game with legendary dunkers Julius Erving and David Thompson in the finals after former occasional Bulls Artis Gilmore, George Gervin and Larry Kenon dropped off. The dunks weren’t as theatrical and imaginative back then as Erving won. There was one more contest in 1976-77 with the merger of the leagues. It was a season-long elimination with the winner Darnell Hillman, known as Dr. Dunk and more famous for having the biggest Afro haircut in basketball. Jordan’s dunkoffs against Wilkens in 1987 and 1988, the latter in the last All-Star game in Chicago, were regarded as standards of the competition and filled with controversy because the league’s best players participated then. The dunks then, however, weren’t as significant as their presence. Vince Carter’s assortment of artistic and original dunks in 2000 became the standard for creativity. They were at least matched by LaVine and then arguably the most inspired dunkoff in 2016 when LaVine went to extra dunks to defeat Orlando’s Aaron Gordon. "I just remember the energy of the crowd," said LaVine, who became a winner in 2015 over Victor Oladipo as a 19-year-old. "I took it over a little after my first or second dunk; I could feel the energy, how everything shifted to me taking that spotlight. The second time was just a battle. It went to the overtime period and it was just who had more dunks. "I’ll see how I’m feeling next year or the year after that. I’ve still got some tricks in my bag, so I might just do it." - Zach LaVine on if he will participate in another Slam Dunk contest. "It kind of ruined it for me," LaVine said with a laugh about the overtime. "Kind of wasted some of my dunks for the next year. We put on a show that won’t happen for a very long time. I think that was the best dunk contest of our generation of players since the Vince Carter one. But with both players doing it, I think that was the best dunk contest ever." The Jordan dunks then were known as the rock the cradle, kiss the rim, duck your head, reverse and the famous free throw line. Though he never won a dunk contest, my favorite was Darryl Dawkins’ Chocolate Thunder flying, Robinzine crying, teeth shaking, glass breaking, rump roasting, bun toasting, wham bam, glass breaking I am jam. It was a glass backboard shattering (when that did occur) slam dunk in 1979 over the Kansas City Kings Bill Robinzine. Dawkins was warned by the then commissioner he would be fined if he didn’t stop breaking backboards. The NBA wasn’t in sound financial condition at the time. These things are not exactly official. But when LaVine and Gordon faced off in 2016, it was the only time all the finals dunks were perfect score 50s. Which was perhaps no surprise since Zach as a teenager in 2015 came into the contest on a pretty big stage in Brooklyn and scored perfect 50s on his first two dunks. LaVine doesn’t dunk as much as he used to, but he remains one of the great athletes in the world with incredible first step explosion. In that 2015 contest, LaVine relied on teammates Andrew Wiggins and Shabazz Muhammad as props, and in a prophetic tribute came out wearing a Michael Jordan No. 23 Space Jam jersey. The teenager shocked everyone coming out with a dunk in which he tossed the ball ahead, caught it with his left hand, went between his legs to his right and threw down a windmill. He also had a reverse between his legs on a Wiggins handoff and a behind the back dunk while still going up. Sports Illustrated called his dunks, "A dream come true." Then LaVine went even one better in 2016 that was extraordinary for the rare circumstance of two spectacular dunkers pushing one another through a record eight dunks. "I’m not a big prop guy," said LaVine. "I try to bring something that is just a little outside to make people get up and think about it. His dunks were just as good as mine, if not better. It just came down to what the judges liked. He used the mascot a lot and props. I did mine jumping over things, off the bounce or just trying to be creative in the air. I know a lot of people say he won. I went home with the trophy." "I just remember the energy of the crowd. I took it over a little after my first or second dunk; I could feel the energy, how everything shifted to me taking that spotlight. The second time was just a battle. It went to the overtime period and it was just who had more dunks." - LaVine on his Slam Dunk contests. LaVine then with the Minnesota Timberwolves probably clinched his repeat with the stunning between the legs just inside the free throw line. "Probably the behind the back off the alley oop and then between the legs from the free throw line near the end," LaVine said of his favorites. "I knew I had to do something spectacular." So what does the master see for this year’s contest Saturday night among Dennis Smith Jr. of the Knicks, Miles Bridges of the Hornets, John Collins of the Hawks and Hamidou Diallo of Oklahoma City Thunder? "I know Diallo," LaVine said. "I watched him in college. He’s extremely athletic off two feet. I think all of them are extremely athletic off two feet. You have to watch out for Dennis Smith; I feel he has a lot of tricks in his bag. I feel it will be one of those guys." Pretty good, but you know, hardly a Zach LaVine.